These ReadyFlush Protect skin protectant wipes gently clean, moisturize and protect skin. Soft, premium-quality cloths are pre-moistened with a hypoallergenic, pH-balanced formula that protects skin at risk of breakdown from exposure to urine or feces. 3.2% dimethicone forms a protective cover on skin, locking in moisture to keep skin hydrated and guarding against rash and pressure ulcers. Flushable wipes are safe for sewer and septic systems. Contains no alcohol, fragrance or latex. 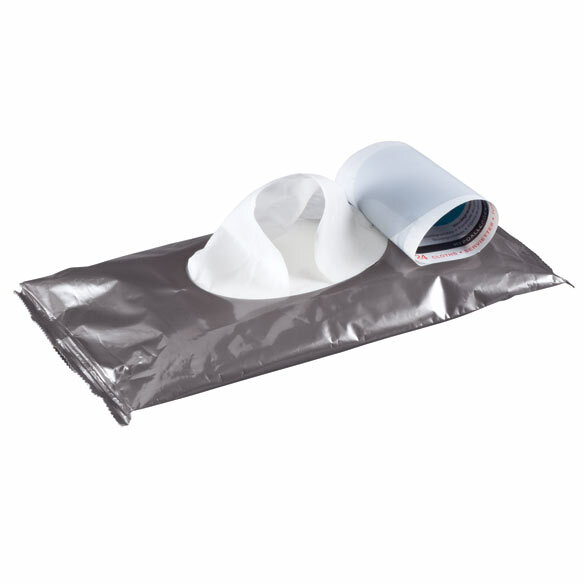 Soft-pack dispenser is ideal for travel. Includes 24 cleansing cloths; each 8” x 12”. Open package as designated. Remove cloths and thoroughly cleanse soiled area. Apply as needed. Dispose of cloth in toilet. I love these wipes they are so soft and leave your skin better. I wanted to find something to help me with my personal hygiene, especially those times I am away from home. Because it has protectiveness in them were as the other did not and I have problems if I don't have protection. I use this type frequently. Keep in bathroom in car.